15 stock and 26 dairy animals. All prices per cwt. Slaughter Steers: Choice 2-3  1446-1460 lbs 114.50-118.00. Slaughter Holstein Steers: No Market Test. 1382-2086 lbs 85.00-96.00. Low Dress 1228 lbs 55.00. 200-250 lbs 125.00-130.00; 250-300 lbs 90.00. 300-350 lbs 75.00-77.00; 350-400 lbs 87.00; 400-450 lbs 50.00-67.00. 400-450 lbs 122.50-142.50; 450-500 lbs 127.50-135.00; 650-750 lbs 82.00-92.50. 650-750 lbs 108.00-110.00; 800-850 lbs 96.00. Return to Farm Calves:  Holstin bull calves sold 10.00-15.00 higher. 85.00-90.00. Number 2  96-120 lbs 102.50-115.00; 75-94 lbs 52.50-55.00. Number 3  70-120 lbs 35.00-57.00. Utility 65-120 lbs 5.00-15.00. Mixed Calves: 80-90 lbs 22.50-82.50. Beef Calves: 70-100 lbs 220.00-225.00. Slaughter Hogs:  Compared to last week slaughter hogs sold 3.00-5.00 lower. Sows had no trend available. All Prices per cwt. Roasters: 120-160 lbs 30.00; 160-200 lbs 43.00-55.00. Sows:  Good 1-3   300-500 lbs 44.00-46.00; 500-700 lbs 57.00-60.00. Feeder Pig:  Under 100 lbs sold per head. US 1-2  50-60 lbs 62.50-90.00; 70-80 lbs 120.00. Feeder Pig: Over 100 lbs sold by the cwt. 170.00-182.50; 90-100 lbs 167.50-173.00; 140-160 lbs 147.50. Ewes: Good 2-3  120-216 lbs 72.50-85.00. Slaughter Goats:  All goats are sold per head with estimated weights. 130-200 lbs 155.00. Selection 3  80-130 lbs 80.00-145.00. Billies: Selection 1  100-150 lbs 205.00. Selection 2  100-150 lbs  155.00-200.00. Wethers: Selection 2  100-150 lbs 240.00. Bred 7-9 Months: Common 330.00-550.00. Bred 4-6 Months: Medium 480.00. Bred 1-3 Months: Medium 430.00-460.00. Dairy Replacement Heifers. Sold ny the head. Service Bulls: Sold by the cwt. 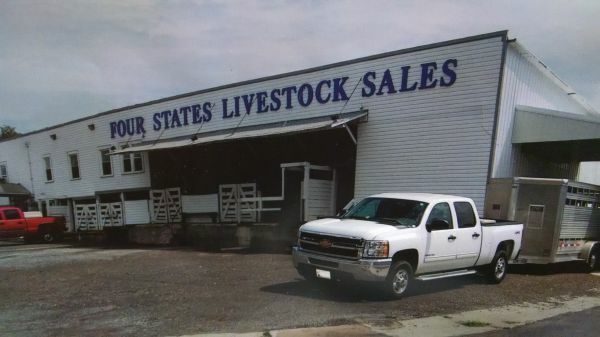 Stock Cows: Sold by the head or family. Angus: 860 lbs with 130 lb bull calf 800.00. Bred 4 Months 1440 lbs 750.00. Herford: 800-1300 lbs  with calves 100-200 lbs 750.00-825.00. Bred 4 Months 1000 lbs 450.00. Crossbred: 1240-1460 lbs with calves 150 lbs 585.00-900.00. Bred 2 Months with calves 150-250 lbs 775.00-925.00.
do not fit reporting categories and are not included in this report.